Unfortunately, your photos won’t last forever. The longer they sit in a closet or basement the more they decay. This happens even faster if they are exposed to direct sunlight, high humidity, and extreme temperature shifts – even if you keep them tucked away in a photo album. 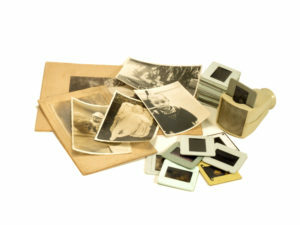 The only way to truly guarantee the safety of your precious memories is to preserve them digitally. We offer our personalized, in-house photo scanning service to help you preserve the memories of you and your loved ones. Contact us for more details! Turnaround on most photo or slide scanning orders is 1-2 weeks. Large orders may take additional time. Scanning Services: We take all of your loose photographs, slides, and negatives, dust them, and scan them at a high resolution. We then review each image, properly crop them, bring back the true colors, fix red eye, and remove minor flaws. 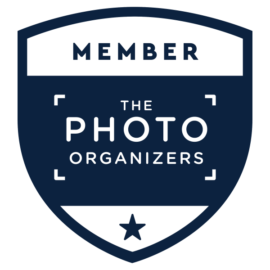 Starting at $19.95 for your first 50 photos, and $29.99 for your first 50 slides. Additional photos are $0.25 each, additional slides are $0.50 each. Please Note: There will be an additional hourly handling fee for photos that we receive in albums or frames. 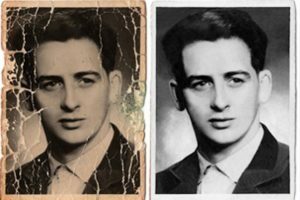 Old Photo Restoration: If your photos need a little more TLC because they have major fading and stains, big scratches, or even if your photos are ripped in half – restoration is what you need. Our highly experienced photo restoration team will carefully restore your old photos so they look new again. Starting at $24.95. No matter how old; we can scan your photos, slides, and negatives. Scratched, discolored, or torn photos need extra TLC.